I DESPISE THE TERM “SHOW BAND” – Block Us Up! What is a “Show Band”? It is one of those terms that linger on through history always loosely defined by someone pretending to know exactly what they are talking about. What constitutes a show band if all bands perform shows? Google defines it as a band that plays cover versions of popular songs… (like every band ever assembled) or a band, especially a jazz band, that performs with “theatrical extravagance”. Hmm.. So basically if your performance is entertaining an audience you are a show band? 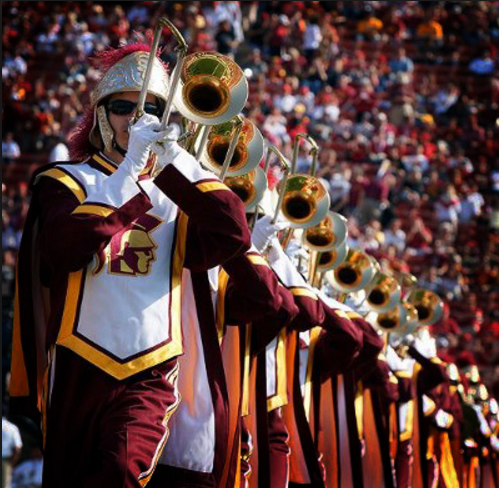 Some often associate the term show band or show style to College or University Marching Bands who march the traditional style of march (knee lift or high step) and perform dance routines. As a music educator, this is the scenario in which I’ve encountered the term. But not all bands that high step and dance are labeled “show bands” or “show style”. So what makes a band a show band? What is interesting is that, depending on who you are talking to, two of the bands on the above videos are categorized as “Big 10 style” or Traditional Style and one is labeled “Show Style” or “Show Band”. It was hard for me to distinguish the differences between the bands in the videos. Besides the fact that two bands consisted of majority caucasian members and one band consisted of majority black members there seems to be no other categorial differences. In a recent interview, a prominent band director stated… “I despise the term “Show Band” of which so many of our fellow music colleagues have coined us. It is called “traditional” or “Big Ten” style, and it deserves the same respect that corps style marching gets.” So is this about respect between two opposing styles? Is the term “Show Band” likened to a slur in the band world used to describe “lesser than” or “for entertainment only” bands? I’d like to know your opinion on it. I for one think the term is ridiculous and holds no purpose. All marching bands do “shows” and we all strive to be entertaining so I guess we are all “show bands”. We need to get rid of the terminology that divides us and use the one word that brought us together in the first place: BAND. Pingback: I’M BETTER THAN YOU! : The Elitist Mentality Of Music Educators | Block Us Up! Although I do agree. Remember that back in the 50s when this style of marching was created the only other style was “Military” style marching band. Very traditional precision drill. 170 high schools (and growing) still march this style but I am sure that the term “show” was coined because of the modern music (compared to marches) and different tempos (compared to just 120) that the Military bands were and still are marching to. I am also sure it just stuck because things tend to stick. I DO agree that a lot of bands who would be considered a “corps” band are really a show band and visa Versa. It’s really sad this style doesn’t get more respect. I am a military band director and have converted a few bands (both this style and corps style) to military. I have a high respect for it and if I had to teach anything other than military I would want to teach this style because of the tradition it has (just like military). Modern day corps band is becoming sad and depressing. Wearing sequins and running around and playing whole notes while not being challenged. Yet our two styles get degraded because we DONT have electronic or props or other unnecessary features corps bands have. I am the Publicity Chairman Elect for The National Association of Military Marching Bands and am willing to discuss this further over phone. Wow!!! Thank you for such a knowledgeable post. I agree with everything that you said. I had an excellent experience doing corps style marching in high school and traditional style marching in college. Some where around my 5th or 6th year teaching things started to change for corps programs and I started to not like it as much. I started to see more props and electric equipment than drill maneuvers. I guess I’m a traditionalist in that I prefer the marching bands of old. Just a horn, the field, and your body is all you need… Yes, we should continue this conversation, it is a great one!